One burning NFL draft question for each NFC team: 'Skins thinking QB? Published: Dec. 23, 2018 at 03:01 p.m. Published: Oct. 29, 2018 at 12:46 a.m.
San Francisco 49ers quarterback C.J. 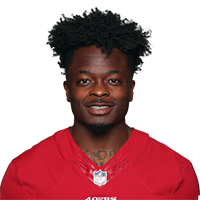 Beathard tosses a short pass to wide receiver Marquise Goodwin who breaks loose for a 55-yard touchdown. Published: Oct. 15, 2018 at 09:35 p.m.
San Francisco 49ers wide receiver Marquise Goodwin goes one-on-one with Green Bay Packers cornerback Tramon Williams for a 30-yard touchdown. Published: Oct. 15, 2018 at 09:13 p.m.
San Francisco 49ers quarterback C.J. Beathard drops perfect pass to wide receiver Marquise Goodwin for a touchdown.